At OBEX, we’re always in favor of technology that cuts down on interruptions for employees. So, we were intrigued by this little gadget created by a self-professed amateur tech wizard. 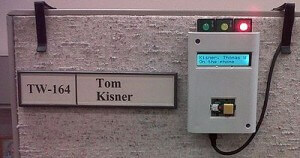 Check out this wiki on how to make a Lync cubicle presence indicator. It takes cubicle etiquette to a whole new level. Instead of walking into someone else’s cube, knocking on a cube wall, peeking over the top of a panel, or hollering back and forth, visitors can announce their presence with the push of a button. The indicator also features a button that can be pressed to send you a popup message on your computer screen. This alerts you to the fact that someone “out there” wants to speak with you. If you’re not at your desk, you can set up the button so it rings your cell phone. Then, you and your visitor can talk through your computer’s mic and speakers. The whole project is fascinating (and the instructions and code are all free/open source so you can make your own). Is this a tool you would use? Would it make the workplace more polite? Can you see how installing these on your cubicles might increase privacy and productivity even more? Have you seen any other gadgets that would make a good match with our panel extenders?